Nightlife: Trap Pop Construction Kits from Big Fish Audio offers you a great collection of 50 Trap-influenced Pop Kits. Everything from Trap Hi-Hat patterns, deep baselines, and 808s, to catchy Synth hooks and Vocal chops, giving you many options to pull inspiration from. 3.9 GB of original content means that you’ll have tons of files to work with. 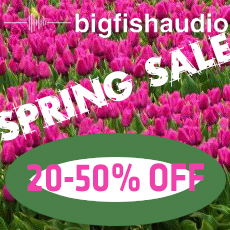 As an added bonus, Big Fish Audio included MIDI files for Bass, Keys, and Synth files so that you have total control over the sound of these kits. Nightlife: Trap Pop Construction Kits has been formatted in the most widely-used formats: Apple Loops, Acidized WAV, and REX files, making it usable in virtually every piece of software and hardware on the market today.